It's been just over 2 years since Qualcomm first started showing off the Mirasol screen, and a little over a month since the first Mirasol equipped ereader hit the market. And today I have one in my grubby little hands and can finally post a first hand review. I've been looking forward to the screen on this device for over a year now, and I find it difficult to express how disappointing the actual device is. Yes, the screen tech is very cool, but the device wrapped around it does not live up to the hype that Qualcomm generated over the past couple years. 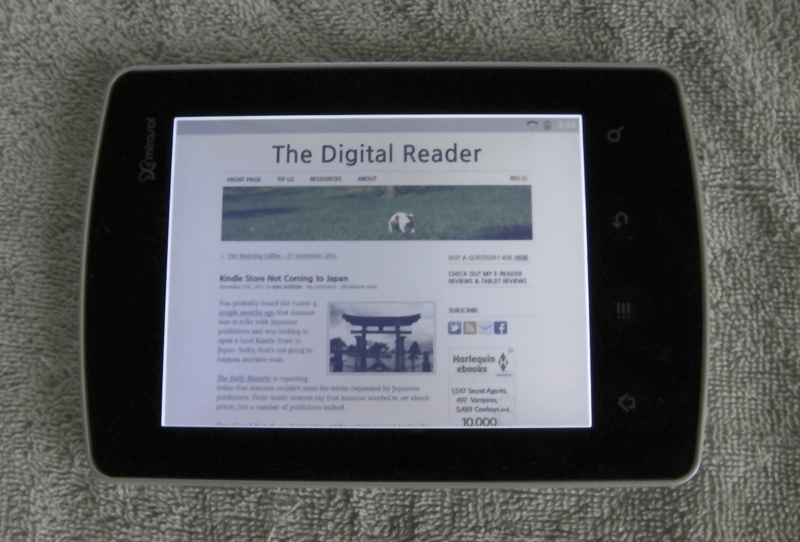 This is actually my second post on the Kyobo Mirasol eReader, and the first was more of a how-to guide. There are a number of details on this device's abilities that I haven't repeated here, so I suggest that you go read that post as well. I'm also going to cover the screen tech in a later post because I feel that the device itself deserves its own discussion. So what's the device like? 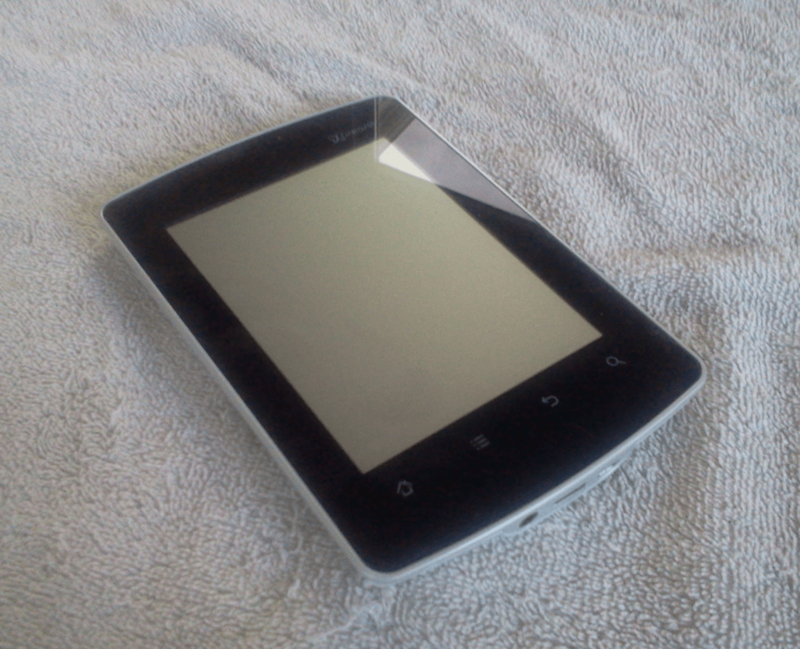 The Kyobo Mirasol eReader runs Android v2.3.5 on a 1GHz Qualcomm SnapDragon CPU, but it is most definitely an ereader. It's not a tablet, and just to make sure it stays that way you are blocked from installing apps. While I have not made any strenuous effort to bypass the block, all the obvious tricks did not work. The screen measures 5.7" and it has a capacitive touchscreen. It has Wifi, of course, but it also lacks any accessible internal storage. If you want to load your own ebooks you will have to get a microSD card. There's a power button and microphone on the upper edge, and on the lower edge is the headphone, microSD card slot, and USB. On the lower back of the device are a pair of speakers. It also has a set of notches on the upper and lower edges that I believe are intended for a case. I wish I had the case, because the back of this device is smooth. It's not easy to maintain a good grip (without having a thumb on the screen). I've found I cannot use it one handed. The Kyobo is noticeably heavier than any of my 6" ebook readers, and I have to be careful how I hold it so I don't drop it. One of the key selling points with the Mirasol screen is that it is a low-power alternative to LCDs. 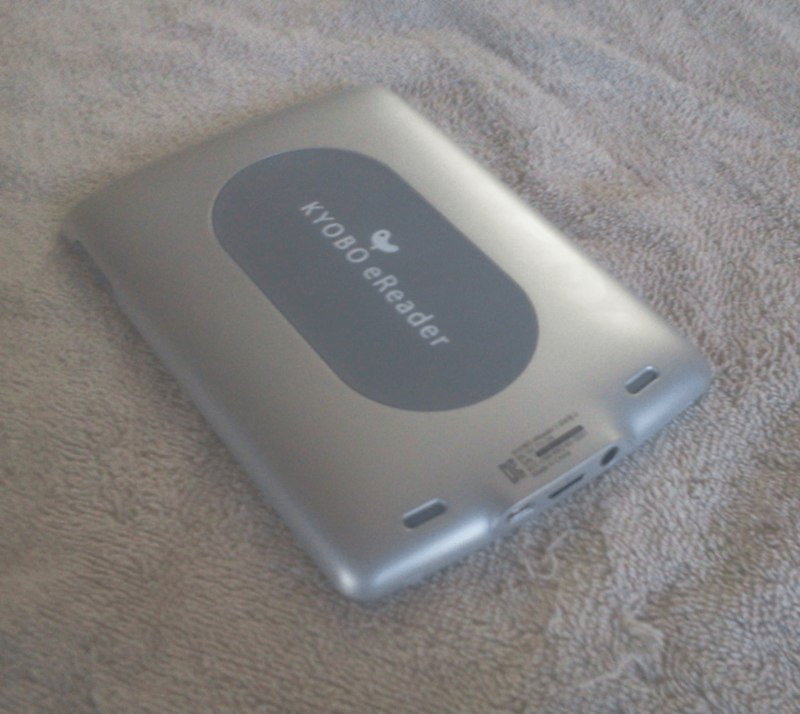 Unfortunately, the Kyobo eReader is an example of how battery life depends on more than just the screen. The CPU, software, and general hardware design is almost as important as the screen tech. This is doubly true with any device using a low-power screen; the rest of the device uses a greater proportion of the battery power and a poor design can negate any savings from the low-power screen. I've only had this device for a week, but based on how the battery is dropping with only light usage (with Wifi on) I am going to estimate that actual battery life is not much more than 2 weeks. Clearly that is far less than a number of ebook readers, and it's also not much more battery life than some of the better tablets. Qualcomm Kyobo blocked a number of tablet features on this device, so you would think that it would at least be a good ebook reader, right? Well, no, it's not. First, it takes over 30 seconds to open an ebook. Yes, 30 seconds. I timed it. Also, the reading app crashes often. It kicks me out to the web browser, which is a little strange. I'm guessing that I end up at the browser because there's no actual home screen. Note: this stability issue might be useful for hacking the Kyobo eReader. I cannot get it to load DRMed ebooks. I tried repeatedly to authorize this device with Adobe DE, but the app never noticed it. While I have an extensive library of DRM free ebooks, I still feel that DRM support is one of the minimum requirements for an ebook reader - especially one that costs $300. To be fair, I'm not sure that the DRM is a valid complaint. No one ever claimed that the Kyobo could support Adobe DE DRM. But you have to wonder why it doesn't; that's the dominant Epub format. Next, this device does not properly support Epub. Yes, the spec lists PDF and Epub, but the reading app does not display the CSS correctly nor can it find the external TOC in an Epub. It also cannot use an internal TOC because it's not configured to let you click on a link. And the reading features are quite limited. It has a landscape mode for both PDF and Epub, which can be triggered by the g-sensor or locked in one position. I can adjust the font size or set bookmarks, and that's the limit of the actual functional features. I can also theoretically search for a word, look it up in the dictionary, or use TTS, but none of those features work for me. The search does not work, the TTS is crap, and the dictionary is in Korean. On the upside, the page turn speed is slightly faster than that of my Kindle Touch. But it is also slightly slower than the page turn speed of Aldiko (running on my Samsung Galaxy Tab). PDF support is also lacking. There's no reflow mode nor any set zoom levels (fit to text would have been nice). You can zoom using a inch (and you can scroll around a page), but it's incredibly sensitive. It was very difficult to get it to zoom to any specific level. The reading app is exceptionally disappointing. While I could forgive the latter several broken features, this app fails at basic abilities like DRM support and properly displaying ebooks. These are the kind if mistakes that you do not make with your flagship product. The video abilities of this ereader do not make up for the poor reading app. Like I said in my getting started post, this device doesn't have a video app. That means there's no way for you to play the demo videos that Cheryl Goodman showed off for NetbookNews. To be honest, I think the video app was left out deliberately. But lucky for me this device is using a standard Android web browser so I was able to watch Youtube. I wish it had been blocked. This device has a slow refresh rate for video, and the refresh rate is most obvious with higher resolution videos. It's so slow that I could often see it pause after refreshing 2/3 of the screen and then the rest would update. Also, it has an annoying screen wipe when the scene changes in a video. And when the camera view scrolls to one side, it's jerky. These problems are likely due to a crappy graphics driver, but it boggles the mind that anyone let it happen. In fact, now that I've seen it in action, I can understand why this device was locked down. If this ebook reader had been released as a tablet then there would be shrieks of horror from almost everyone. The video abilities are that bad. I've carefully left out details on the screen tech and focused this post on just how well the Kyobo eReader performs as just an ebook reader. While I do lust after the screen tech, I felt that the rest of the device deserved its own review. This is a most unsatisfactory ebook reader. It's not only limited in features, but it is also unstable and less capable than most tablet or ereaders in its price range. There are many devices on the US market that offer a better value, and that includes both tablets and ebook readers. I would get one of those. But if you're lusting after the screen tech, I'd still wait for a better device. I freely admit that I bought this just to see the screen, but I regret that. I wish I had waited for the next model. It's bound to have better performance. Seriously, Adobe DRM must be killed. It’s a huge threat for customers. Nate, thank you for the informative review. I too was looking forward to a device with a Mirasol display, and this comes as a huge disappointment to me. I suspect it will be at least another year before Qualcomm’s new plant is up and running and probably longer before we see another Mirasol device on the market. This may be the only one for quite some time and perhaps may become a collector’s item. Thanks for writing this very thorough review. What a disappointing device. I wonder if any other companies are planning to start using this screen tech in e-reading devices. I wonder if the issues re: epub and adobe DRM issues are due to this being a Korean product, intended for a Korean audience. Other than that- how does it compare to Pixel Qi? Thanks for a solid review.. looking forward to those comments on the screen and the tech behind it and hoping that it really is the rest of the device that makes the Kyobo such a waste of money. I have been waiting for a functional mirasol device for many years now, and it is truly very disappointing this will not be ‘the one’. It’ll probably be years before we see any decent Mirasol device appear. Maybe I should buy a Samsung Galaxy Tab or an Ipad after all, just to be able to properly read pdf’s on a portable reader. That is something no ereader can pull off properly, and I’d love to use it for my classes. I’m not sure why your images are in ultra-massive PNG format. Many thanks for the review, regardless. >>Qualcomm blocked a number of tablet features on this device, so you would think that it would at least be a good ebook reader, right? Well, no, it’s not. Qualcomm is not in the business of blocking features.. They only sell the chipsets, what the customer does with them, is up to the customer, in this case the Kyobo ebook oem. You’re right; that should say Kyobo, not Qualcomm. It’s fixed now. Wow this is kind of a bias review considering there’s little to no ereaders that have color and are viewable. Like the notion ink adam. Pssshhhh about 2 weeks well duh its a color one its not friggin e-ink like the kindles, which ereaders are you talking about that have color, WHICH ONES?? But I do agree with the browser stuff, and it being locked. Just like everything that comes out, it come with its baggage of bugs and glitches, hopefully you can repost when it the software gets updated. I’m sorry but you are incorrect. There are lots of ebook readers with color LCD screens. And then there are the many tablets that have color screens. Horrible news for me, I was looking for an e-ink color display to success because I suffer terrible eyestrain from normal lcds. Maybe with a hack, like they do with kindle, I know some guys installed debian on it. I’ve installed Kindle, moon+reader and free office app. I can’t use this before install other apps, but after rooting, it is really useful to me. If you want install other apps, I’ll help you. You actually rooted a Kyobo reader? I’d love to hear how you did this and what your experiences are like with the device now. Any advice on how to root device properly? I did reflash boot wit fastboot – hwoever adb doesn’t start on device properly. Actually did manage to connect to device after editing hardware id’s in the driver .inf file. It came from korea. Some guy made rooting script and he installed google market. It is really easy and safe. Instruction is korean but you just need [enter] key and Kyobo eReader. You can use Kindle, nook, Kobo and other ebook app in one ebook device. You can use Newspaper apps also. If you Install go launcher, it just looks like normal android device. It’s amaging experience. – nothing happened is normal. – everythings you need for tooting is here. – 1 is very important. you have to see [? fastboot] when you excute 1*.cmd and enter twice. – If you can see [? fastboot] just enter. can’t try 3rd again. 6th, if you make 5th, device will reboot, after reboot, run 2 to 5 script. and connect to wifi, log in google account, run market, and install kindle, nook and other things you want. I agree this review before install google market, after rooting, it is everythings for ebook reader!! I have those instructions posted elsewhere, but I never could get the drivers to install. Nate, did you ever get access to your SD card… I have just got a Mirasol… and running into some issues. Please can you share any knowledge experience with me about how to approach this all! Where can I download mirasol_rooting_and_market_install.zip? I am a beginner when it comes to ereaders and rooting. Can somebody tell me how to root the kyobo step by step…i really miss some apps! I would appreciate it if someone could tell me; I cannot get it to work. I’d love for someone to tell me as well. I think there are enough of us here now that desperately want to root the reader as painlessly as possible. 1) Load the driver files onto an XP box. I loaded the drivers in the Qualcomm directory and there might have been 2 devices recognized but I can’t be sure as I went back and forth with this a few times. 2) Plug Kyobo into PC via USB and enable Kyobo USB connection via Notification icon (drag down from status bar and Turn On USB Storage). There is an adb_install script in mirasol_rooting.zip. I may have also ran that file before getting everything working as it wasn’t really clear to me what was doing what. After messing around for a few tries, I noticed a superuser and market icon on the icon bar and everything was good. I’ve also got Adobe Digital Editions working on my Kyobo. I loaded the Aldiko reader app to get this started. I could not get Adobe Digital Editions to work directly on my Kyobo and have it set up to load the DRM epub books into my Kyobo through a Win7 Adobe Digital Editions PC Client. Signing into Adobe Digital Editions directly for my Kyobo gives me a error stating it “Failed to Authorize Device”. However, enabling my Kyobo USB Storage to my Win7 box when I have the windows version of Adobe Digital Editions running on my Win7 box let me authorize the divice through that mechanism. I can then download DRM epub books to my PC and transfer them to my Kyobo. All is well and good in the near north. The only issue I have with my Kyobo is the battery limits usage to about 2+ hours of wifi per charge. I am hoping that can be improved by loading apps to turn wifi off when the device becomes idle and also reducing automatic notifications. I especially like the Mirasol display in a well lit environment. The front lighting mechanism tends to wash colours out a bit but but when good external lighting is used the screen is more than adequate for reading and surfing. Joe, did you get your Kyobo Mirasol up and running? desperately need help as you did (or do)? What ist a XP box? i did google it but i didn´t get good results. That refers to a PC running Windows XP (as opposed to Win7, Vista, etc). Ive recently got hand on the Kyobo Mirasol – i see you had similar issues. Can you help me pleasE? At first impression, the display it’s not up to the expectations and to all the buzz and marketing around it… But i’ll dismantle the reader…and remove all the glasses in front of the display :D.
Regarding the display – many asked how it compares to pixelQi – I’ve seen them both and I can say they are quite similar in appareance – i.e. with the background silvery gray. But Mirasol has more vivid colors under direct light. As a reading experience (in daylight – I didn’t get to use it during night time – I jost got it), i’d prefer any other e-ink based e-reader (Bookeen is my favourite!!). They are far more paper like than Mirasol. Mirasol looks much like an tranfelctive LCD screen – the type you find in poket calculators or in old PDAs. For pictures, however, the display gave me a good impression – I can imagine it as a photo frame! What I don’t like, and this is intrinsic to the technology, are the color shifts with the viewing angle and the spatial dithering. From the technology point of view, the display is capable of reproducing only 8 cloros (i.e. 1 bit per RGB color). OK – for an e-reader, that’s what you’d expect to use – spatial dithering! Of course, for a normal device (power hungry), you could use temporal dithering. I wonder if it will be possible to switch between these display modes in a future e-reader. Anyway, during video play, the reader uses a combination of those dithering techniques – with the temporal one based on the frame rate or even slower than the frame rate (I looked at the display with a magnifier and I was able to see the pixels dancing – so the dithering refresh was far smaller than 10 fps). Maybe I’ll get later with more info after I dismantle it! Can someone tell me how to install the android drivers? Joe, did you ever get your Kyobo e reader to work properly? Please let me know I’m getting quite deperate! does anyone know how to load the drivers so you can access the USB card? Ereaders and smartphones /are/ tablets (a form factor), dolt, as are slabs of clay and wax.